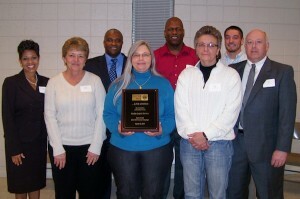 United Way of Davidson County: Recognizes FLS With Spirit Award - Facility Logistic Services, Inc. Facility Logistic Services receives the Spirit Award. From left to right; front row- Deborah McNeill, Cleta Ramsey, Paula Bruff, Pam Stepp, Eric Myers. Back row- Darrell McNeill, Warren Hairston and Billy Franklin. Facility Logistic Services was recognized with the Spirit Award at the 2013 annual meeting of the United Way of Davidson County. The Spirit of Davidson County Award is given by the United Way of Davidson County each year to companies that excel in their annual United Way Campaign. Spirit companies provide volunteers as well as dollars to the United Way Campaign through the Loaned Executive Program, volunteers for the Fund Distribution Process, Week of Caring projects, donated materials, or as Board Members for the United Way of Davidson County. The Spirit of Davidson County Award demonstrates that a company has gone “the Second Mile” in order to provide for the special human service needs of Davidson County citizens. Facility Logistic Services is proud to have received this award and appreciates the recognition. We look forward to continuing our commitment to United Way and supporting the communities where we work. This entry was posted in Blog and tagged 3rd party logistics, facility logistic services, fulfillment, insourcing, Lexington North Carolina, manufacturing, north carol, north carolina warehouse, supply chain, United Way of Davidson County, warehouse staffing. Bookmark the permalink.